How do you lock in the best professional to protect your business? Whether you are replacing keys or locks, installing a new access control system, or repairing hardware here are 10 tips to consider that ensures you secure the best commercial locksmith near your establishment. Don’t get scammed by contacting a call center that pretends to be local, but really sells your information to the highest bidder. They place an ad online using a fake local address and a fake local phone number that rings a call center from God knows where. They either don’t mention the name of their company, because they don’t know which company will buy their lead yet (yes, you the business, is considered a lead), or they mention the name of their company, but an unmarked van shows up pretending to be whatever company they bought your information from. There’s a considerable difference between commercial and residential locksmiths. Businesses generally require higher security, can be more complex and may be subject to certain legal regulations. Some locksmiths do both residential and commercial (as well as automotive, which involves yet another set of competencies) and some specialize. In any event, check that the locksmith has commercial expertise and experience. Commercial locksmiths work on a variety of properties—office complexes, retail stores, warehouses, shopping centers, apartments/condominiums, hotels/motels, government and university buildings and the like. Make sure your local commercial locksmith has experience with your particular business property and is familiar with your unique needs. Write a list of exactly what your needs are, not only in terms of your current security concerns, but also in the future such as a planned facility expansion. Determine whether the commercial locksmith has the products and the capabilities to satisfy both existing and impending requirements. For example, some companies may be able to rekey all your entryways, but don’t have the latest knowledge of high tech systems designed for highly secure locations. 5. What Can They Do In An Emergency? An employee gets locked out, or there’s been a break-in and a lock needs to be changed immediately during off-business hours. Does the commercial locksmith have the resources to respond to your emergency needs in a timely way? If not, can you afford to wait around until help eventually arrives? Or worse, do you want to be in the position where you’ll have scurry around to find another company near you to help when you never used them before or had time to properly check them out. How long has the commercial locksmith been in business? What other clients do they have and would they be able to provide any testimonials or references? Make sure you check the locksmith’s online reviews as well. 7. What Brands Do They Carry? It’s true that many off-brands have the same quality and reliability as more recognizable brands, and are worthy of consideration in any application. That said, a commercial locksmith that demonstrates the experience, the training and the reliability to carry big brands also bring those same qualities to serve your business. Commercial locksmiths are required by state regulation to be licensed and insured. Ask to see proof of both and it is for your state. You want to be sure anyone working on your property is properly licensed and insured to protect your business and your property in case of an accident or other mishap occurs. Just the fact that they are licensed is an indication they are trustworthy and professional since the Illinois Department of Financial and Professional Regulation (IDFPR) governs the licensees. Also, the Illinois Locksmith Act of 2004 requires a certain amount of training and background checks in order to earn their license. 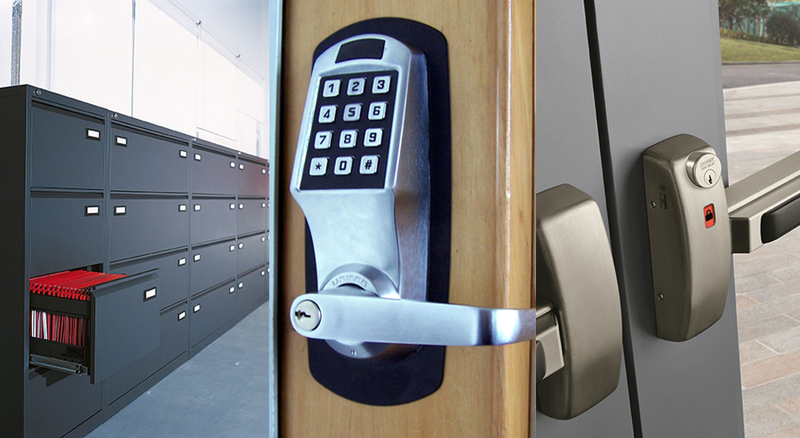 Get a written quote of what kind of work that commercial locksmith intends to provide and with what products. The estimate should include such things as the fee for a service call, labor, cost of parts, emergency service charges and other additional fees that could be charged. All reputable locksmiths do this as par for the course. Properly securing your property is vital to protecting your business assets. Yet too many companies put this off as something to get around to, as opposed to a priority action item. The time to evaluate what locks and systems you need—whether upgrades or replacements or new installations—is before an unauthorized entry occurs, not after. Hawken Locksmith Services has provided professional and reliable commercial locksmith services near your establishment for the last 20 years to a range of local businesses, schools, police departments, industrial buildings and much more. We serve Genoa, Hampshire, Sycamore, DeKalb, Huntley, St. Charles, Aurora, Elgin, and other local Chicagoland suburbs. Our Illinois license is #191000873 and we carry a $1 million liability policy. Contact us 24/7 at 815-762-4464 or 847-989-4804 to install, repair, maintain and upgrade a range of locks, keys, safes, doors, cameras, and security systems.